Do “Entity Attribute Value” (EAV) Models smell bad? Does the Entity Attribute Value (EAV) model have an SQL smell? 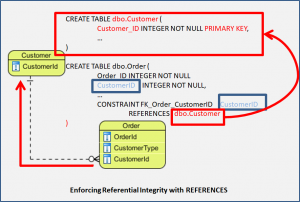 Have you heard of the “Entity Attribute Value” (EAV) Model or pattern? You may have, even if you don’t recognise the name. You can substitute words like: property or feature instead of attribute. That’s right – you have an entity called attribute! 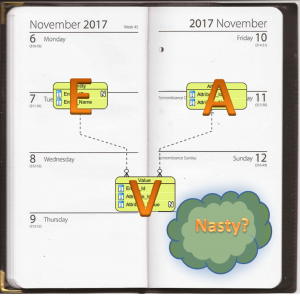 Phil Factor identifies the EAV as a potential “SQL Smell” in this article . I regard the Entity Attribute Value model as a “Requirements Smell” too. There are legitimate uses for EAV, but having an EAV may also indicate a problem. The problem my be with your Conceptual Model, or with the way it has been turned into a Logical Database Design. My previous article dealt with tables which were very wide (have lots of columns). The EAV has the potential to produce a table (the “attribute_value” table) which is very narrow (typically only 3 or 4 columns) and is very long (with lots of rows). Conscious modelling of data abstractions: EAVs can be used to take your requirements to a more abstract level. They are commonly found deep inside of “modelling tools”, CASE tools and other software packages which are intended to be configurable. Consciously making the Conceptual Model “Extensible”: Allowing “user-defined” (or administrator defined) attributes for things is another legitimate use. Anticipating very sparse data: EAV is a way of handling lots of NULLable columns. It uses space efficiently, but at the cost of more complex processing. It’s “cool”! I confess. I have done this. When I first discovered the EAV model, I tried to apply it everywhere. This is not a good idea. Laziness is a very bad reason for using the EAV model. The argument goes something like: “we’re not sure what attributes the users need, so we will allow them to define their own”. The problem with this approach is that these “user-defined” attributes are hard to validate and process design becomes significantly harder. Creates opportunities for re-use: Using the EAV model can create opportunities for reusing code. All those user-defined attributes are maintained by the same code. It can work very well with abstract Object-Oriented design. Can make for very elegant and compact code: Well thought-out EAV code can be compact and elegant. This is one reason why you will find EAV models inside many packages. Can make the data very compact: Using an EAV model can reduce the number of tables you need and the space the data takes up. Data validation becomes harder: The value on the “Attribute_Value” table tends to be stored in a data-type like “varchar”. This makes validation of the data harder. Of course you can start to add validation yourself, but this is adding complexity. Code becomes abstract and hard to understand: Code written to use an EAV always has to go through extra steps compared to having the column you want directly on the table. Data becomes abstract and hard to understand. One solution to this is to add SQL views or a layer of code which transforms the abstract data in the EAV into something closer to what the business users are expecting. The application may need “seed data” which is almost part of the code. This is what happens in some packages. Performance: EAV requires 2 joins to get a value and the attribute name. This has performance implications. We can imagine a simple EAV model where the “Entity” contains a single attribute called “Name”. Retrieving the values of “Name” is straightforward. 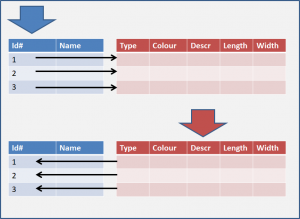 Using the EAV model we can create user-defined attributes called: “Type, Colour, Length and Width”. We can record values for these attributes for any row in the entity table. It is hard to validate the data. We can retrieve the value of a user-defined attributes using a JOIN. To get the “name” of attribute will require a second join. This can get messy! Using the values in the EAV tables to identify rows in the Entity table is possible. This may present a challenge to the designers. 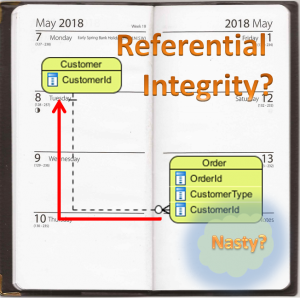 Summary – Does the Entity Attribute Value (EAV) Model smell bad? I agree with Phil Factor. Think hard about whether you should use the EAV model. Using EAV inappropriately can have bad effects. The Entity Attribute Value model may indicate the requirements are not understood. That is always a bad thing. In the next article I’m going to look at another “SQL Smell”. Phil Factor calls this one “Polymorphic Association”. Author Tom GilliesPosted on 2017-11-15 2017-09-11 Categories 2017, Business Analysis, Data Modelling, Normalization, SQLTags Analysis, BA, Business Analysis, Data Model, eav, Entity Attribute Value, Model, Requirements, Requirements Smells, SQL, SQL SmellsLeave a comment on Do “Entity Attribute Value” (EAV) Models smell bad? 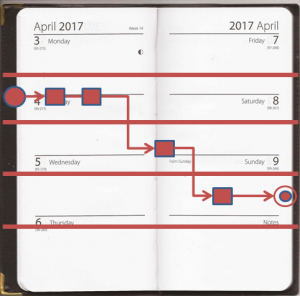 Process Models: Who is doing what? Every Business Analyst and Business Consultant should know something about Process Models and Process Modelling. Creating a simple model of what is happening outside the IT System can be a very useful place to start. You may even benefit when there is no IT System at all! A Process Model is simply a representation of what the process is doing in the real world. This representation is usually graphical. There are different notations, and a large number of tools to help you draw the pictures. Process Models can be used in a number of ways, many of which overlap. A model can be used as a framework to assess the process against some criteria. Models can be used to explore the effect of some change to the process. Models can also be used to show how the physical world and IT interact. Using Process Models appropriately can help ensure that any changes are beneficial to the business. Process Models can be used to explore changes to a process. The “As-Is” model shows how the process works now, and the “To-Be” model shows how the process will work after the proposed changes. Comparing the two models allows us to demonstrate how the changes will be beneficial to the business. The changes need not be changes to IT systems. The benefits which can be demonstrated may be the elimination of roles, or reduction in time or the number of steps. Process Models: How does IT mesh with the business? The Swim-lane process models demonstrate how different roles collaborate or people use several different tools or IT systems to perform their work. Imagine the different roles or tools as “gears” and you will understand what I mean. Using swim-lanes helps you to visualise and communicate how the different lanes interact. 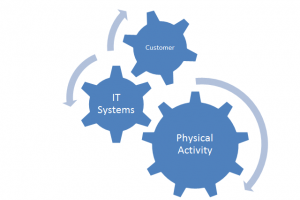 Where a business process involves activities in the physical world (and not just doing things at a screen) then a process model can help put the IT systems into context. Doing this may prevent you spending time on details which are not important. Ways Process Models can trap you! Many process modelling tools allow you to break-down individual steps into smaller pieces. Resist the temptation to break things down too early, or everywhere. If you keep your models at a high level you will reduce the amount of work you have to do, and you will not reduce the value of the models. Process Models can be used to put the IT system into a wider business context. They can even be used to analyse and rationalise processes where the IT systems do not play a significant role. Process Models are commonly used to demonstrate the claimed benefits of a new way of doing things, the so-called “As-Is” and “To-Be” models. The keys to success with Process Models are to present the simplest model which is appropriate for your needs and to control the amount of detail. Author Tom GilliesPosted on 2017-04-10 2017-03-17 Categories 2017, March, Methods, Model, Process, SpringTags BA, Business Analysis, Model, Process ModelLeave a comment on Process Models: Who is doing what?